A beginning. A middle. An end. Every news story has them. Image © David Meerman Scott. Licensed under Creative Commons Attribution – NoDerivs 3.0 Unported License. Here’s a great antidote for anyone who’s scrambling to find a topic for their next blog: Read your favourite news feed, find a hot topic that you genuinely find interesting, come up with an original twist that gives the story new life, and newsjack it. I first stumbled across David Meerman Scott’s concept of newsjacking about 18 months ago, and while I haven’t practiced it nearly as often as I’d like to, I love the idea. That’s partly because it takes me back (way-y-y-y back) to my days as a freelance feature writer in Canada’s Parliamentary Press Gallery: if I could come up with two or three unique angles on a story that matched different clients’ content interests or geographic scope, I knew we’d have a good chance of paying the next month’s mortgage. Fast forward nearly 35 years to a post on the TopRank online marketing blog, where Lee Odden advised would-be newsjackers to own the second paragraph of the day’s headline news. I’ll confess that I’ve never understood the would-be bloggers who complain that they never know what to write about. It’s more than likely that their organizations have years of great material in their archive, just waiting to be updated and redistributed. One way to refresh a piece of content that is solid, compelling, but a bit out of date is to give it a new lead. Newsjackers do that by spotting a breaking story, thinking out a plausible, genuine connection to their own material, then moving quickly to seize the opportunity. Meerman Scott points out that timing is all-important here: every story has a life cycle, often a short one, and it makes most sense to introduce an edgy new angle after the news first breaks, while reporters are still scrambling for new information. 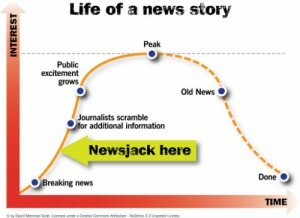 What I like best about newsjacking is that it sets a high standard for content marketing. To use the technique and use it well, we have to be organized enough to move quickly, nimble enough to quickly shift our editorial calendars, and knowledgeable enough to come up with a smart, genuine news angle that aligns a story with our underlying objectives. But the stakes are high, because a newsjack that is contrived, superficial, or just silly will stand out just as much as an effective one—and for all the wrong reasons. If you try to newsjack for spin, not for substance, you’ll be better off with no coverage at all, if the alternative is to be mocked for the effort. Many thanks for this post. As a journalist, you totally get this concept. I find that many traditional marketers struggle with it because they always want to insert their products into the news (that’s part of the lament that they can’t figure out what to blog about). But as you point out, it is about getting your *ideas* into the second paragraph. Thanks also for the reference to my work and the use of my graphic. WOW, thank you for that, David! We’ve been talking a lot in-house and starting to write a bit about this interesting feature of content marketing: It brings marketers together with ex-journalists, and the community is at its best when it works as a synthesis of the two traditions. For the marketing side, that means more than just *saying* that the purpose of a campaign is to open conversations, not just set up product placements. On social platforms that (thankfully) put a high premium on being honest and genuine, we have to mean it, and conduct ourselves accordingly. As you point out, Newsjacking only works when it’s done in that spirit, which means it pulls and prods marketers in the direction of the kind of content we should all want to see when we’re the ones receiving it.